Edinburgh has a tradition of firing every day, a gun at precisely One O'clock. The tradition was necessitated due to the problem of inaccurate clocks in the mid 19th century. For proper navigation the ships are required to keep an accurate time so that by comparing local high noon to the chronometer's time, a navigator could use the time difference between the current location and reference location (GMT) to determine the ship's current longitude. 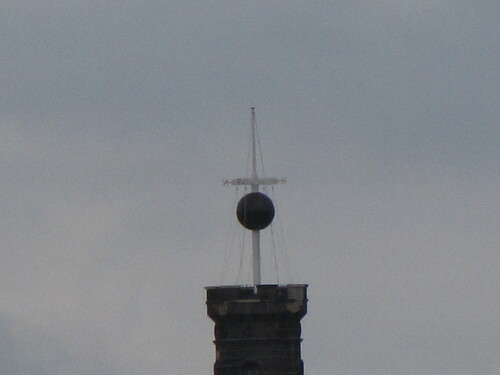 In order to synchronize ship's chronometer before their departure from Edinburgh's Firth of Forth, Captain Wauchope, a Scottish Naval Officer in the Royal Navy installed in 1961, a the time ball on top of Nelson's Monument at Calton Hill, which was easily visible from the Leith harbour. At precisely one O'clock the ball used to drop giving signal to sailors to synchronize their clocks. This method didn't prove very effective as it meant a constant look out before the scheduled time and slight diversion at the precise moment or bad weather meant a missed chance. It was therefore decided to introduce a simultaneous firing of a cannon. Originally an 18-pound muzzle loading cannon located at Half Moon Battery of Edinburgh Castle was used. It needed four men to load and fire the gun which could be easily heard by ships in the harbour 3 kms away. After advent of precision chronometers the gun firing became redundant, but the tradition has continued and is prevalent now a days also. However from 1953 instead of the cannon a 25 pound Howitzer is now fired form Mill's Mount Battery. This is done every day at one O'clock except on Sunday and the occasion is a popular tourist attraction. 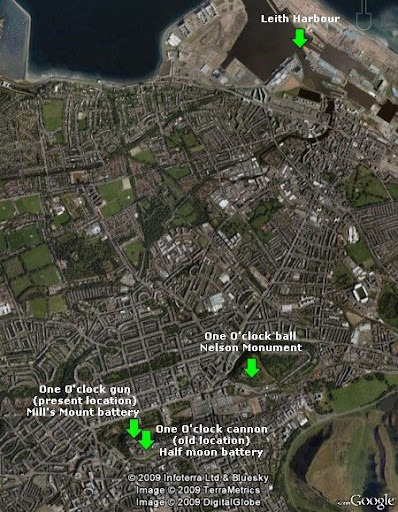 It may be worth noting that time balls and time guns are not unique features of Edinburgh. There are several other places where this practice was adopted but was later stopped. Like Edinburgh some places have retained this practice.